Strapping in ... Jo from Wollstonecraft straps herself in before the race. Making ready ... a racer shuns her red high heels by the start line as she awaits the race in bare feet. 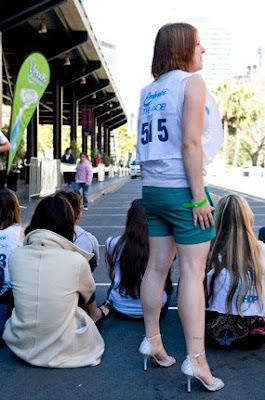 Victorian ... sporting her racing number of 515 Julie has come all the way from Melbourne to take part in today's race. Boys and girls ... 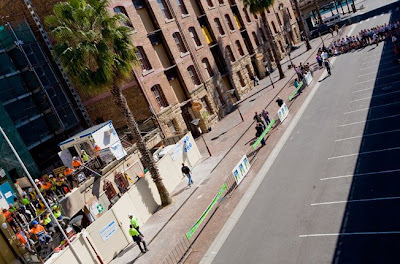 The tradies working down at the Rocks take a time out to watch the leggy ladies getting ready for their race. Stacking it ... just metres into the race, some of the contestants already fall victim to their heels (see right) in the stiletto dash for cash. 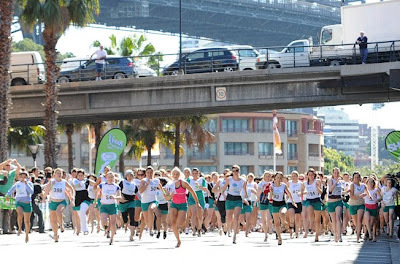 Winners Hug ... a presenter from the Kerri-Anne Kennerley Show show is the first to congratulate Brittney as she crosses the line. Rising Star ... race winner Brittney poses with Australia's fastest ever sprinter, Melinda Gainsford-Taylor. Brittney was part of the team that recently won the bronze at the Junior Athletics Championships in Poland in the 4x400m relay. 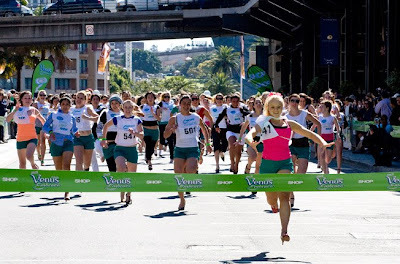 Well-heeled ... Brittney McGlone leads a world record breakingly large field of entrants in the Venus Smooth Stiletto Sprint, which is an 80m dash in 3-inch-plus heels for $5000. Golden slipper ...sprint winner Brittney gives her golden slipper trophy a kiss as she poses on the podium. Her mother tells us that Brittney will be using her prize money to further her athletics career.